Our best Ocarina of Time sage tournament continues with with two new characters. 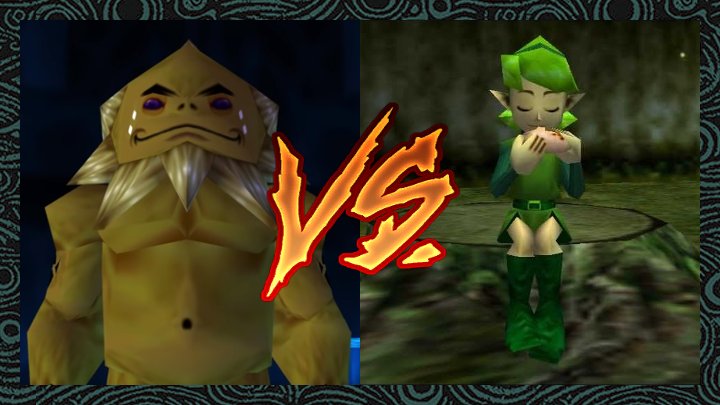 As Zelda and Impa duke it out in Monday’s poll, Darunia and Saria enter the fray. This is the clash I’ve been waiting for. Darunia enjoyed a groundswell of support during his Round 1 fight against Nabooru. The Goron chief’s fans were quick to point out his endearing personality, his proficiency with hammers, and his epic dance moves. People love the dance moves. In any case, Darunia’s victory was hard fought, as it took a sizable amount of persistence to overcome the surprisingly popular Nabooru. But with a solid win now under his belt, Darunia proves that he has the chops to make it all the way to the top. Saria absolutely destroyed her competition during our last round. Earning nearly 200 more votes than Rauru, the Sage of Forest won by the biggest margin of any Round 1 bout. That’s an impressive victory, for sure. Saria clearly has a lot of passionate fans rallying for cause, and it’s not hard to imagine why. She’s loyal, generous, and kind; all the makings of a true champion. Saria seems to have plenty of momentum going into the Semi-Finals, so let’s see if she can pull off another splendid performance. Who is the Best Ocarina of Time Sage? If you receive a “Failed to Verify Referrer” message and you are logged into a version of WordPress, try logging out. We will post a new Semi-Finals voting page on Monday and Wednesday. On Friday, we will post a wrap-up article explaining the results of the prior week. Once voting pages for all Semi-Final bouts have been posted, there will be a one-week break before the Finals begin.